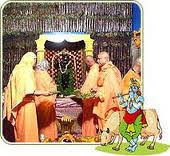 Janmastmi is known as sri Krishna's Birthday.Vrindavan Dham is Known as Sri krishna and gopis ras leela.Vrindavan is quite a famous place for pilgrimage in North India. Just about 15 kms from Mathura, the birthplace of Lord Krishna, it houses nearly 5000 temples both ancient as well as modern. The holy town of Vrindavan is where Lord Krishna spent his formative years. The town situated on the banks of river Yamuna is also known for the famous rasleelas that Lord Krishna performed with his beloved gopis.